Laparoscopic sleeve gastrectomy has been shown to be a safe and effective primary weight loss procedure. With increasing international experience, more bariatric surgery centers are starting to offer sleeve gastrectomy. Our hypothesis is that laparoscopic sleeve gastrectomy as part of a multidisciplinary weight loss program can be safely introduced with acceptable short term results. The first 21 consecutive patients undergoing laparoscopic sleeve gastrectomy at our center between Dec 2007 and Sept 2008 were reviewed. All sleeves were constructed over a 42 F bougie. Staple buttress material was not used and staple lines were selectively oversewn. The 21 patients included 19 females with a mean age of 39.3 years. The mean preoperative body mass index was 50.8 kg/m2 (range 41.0 to 75.1). Mean operative time was 143.9 minutes (range 75-275); all procedures were completed laparoscopically. Mean length of stay was 3.2 days (range 2-5). There were no perioperative mortalities or major complications. No patients required blood transfusions or had staple line leaks. One patient had a compression neuropathy of the gluteal region. One patient was found in a follow up visit to have a pulmonary embolism. Mean follow-up was 3.6 months, ranging from 1 to 10 months. Weight loss outcomes are shown in the table below. 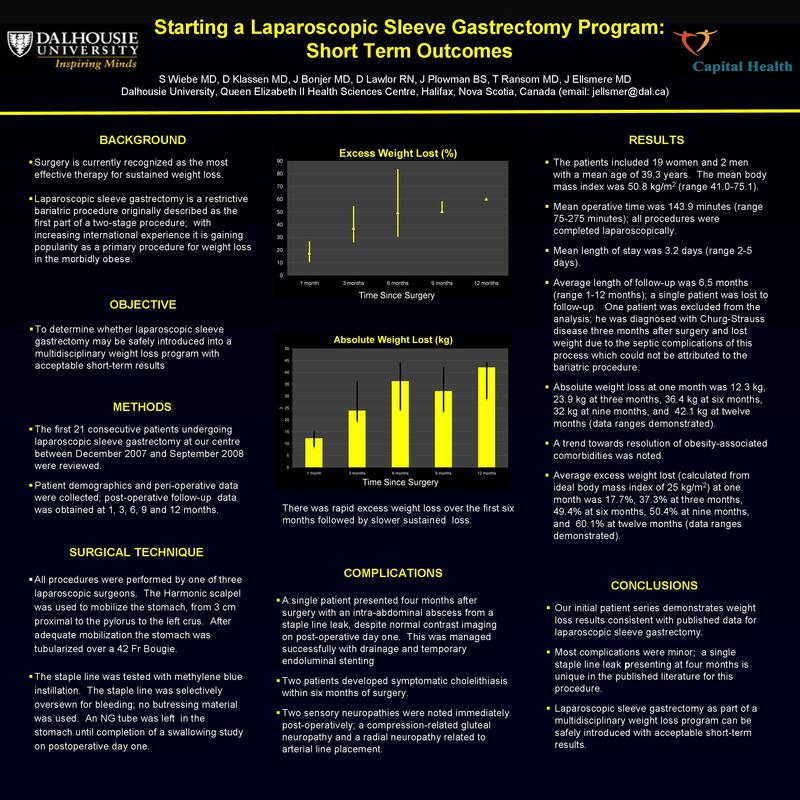 Laparoscopic sleeve gastrectomy as part of a multidisciplinary weight loss program can be safely introduced with acceptable short term results.